Oh no, that’s not for me, I cannot resist to be on a bike for more than 10 minutes. I get tired easily, so no way!!! Well!! The reality was different. Back in 1999, I started running on a tread mill while working overseas since it was my only option to do any exercise. However, being indoors is not fun for me when you work all day long in any office. I thought I’d better do something to keep my life going on and try to enjoy the outdoors. So, I decided to try running at least 3 miles (5 Km) once or twice a week. By the end of 2000, I was running 3 miles with any effort at all. In 2004, when I stop traveling for work, I start running more often and sometimes I was trying to swim for 10 to 15 minutes. Then, I decided to join a Boot Camp Program, which was a big deal for me and I was totally scared about it. The first week, I was feeling dizzy and it was really hard to keep up with the Boot Camp Program. I met several runners at Boot Camp that invite me to run several 5K races, which I did. Since, then I was completely convinced that once can do a lot to improve the personal performance in any sport. What one needs is persistency and training help. I became Boot Camp assistance in 2005 and since 2007 I have been a Boot Camp Instructor. Three years ago, I went to see a couple of friend to run a spring triathlon in Galveston, TX, and I like too much, that I bought a bike and decided to do ONLY spring triathlons, since biking was hard for me. 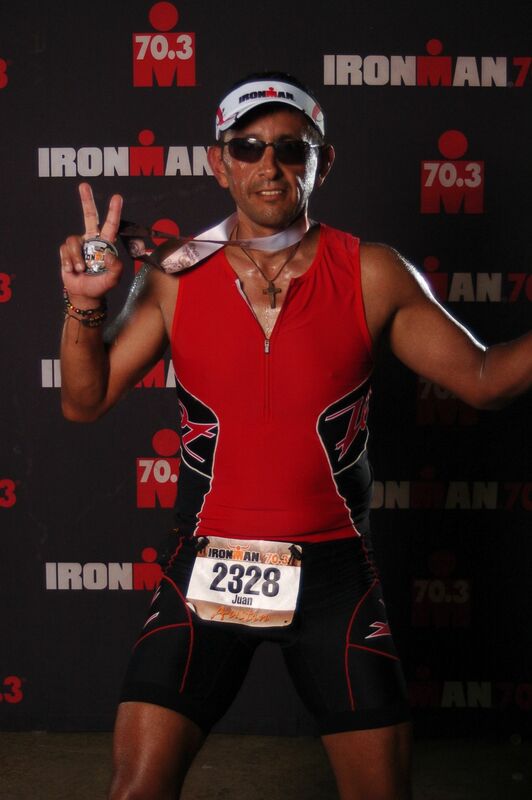 Finally, as on my friends said: “Juan has been totally intoxicated by the triathlon world”. Juan has been running since 1999. Up to now, I have been running more than 10 Half Marathons, 10 Marathons, around 25 spring triathlons, around 8 Olympic triathlons and 9 IRONMAN 70.3. For this year, I have aligned the Houston Marathon, Woodland Marathon, few Sprint and Olympic triathlons, IRONMAN 70.3 San Juan and IRONMAN 70.3 Galveston. Current USAT Coach Certification Level I until December 2014.